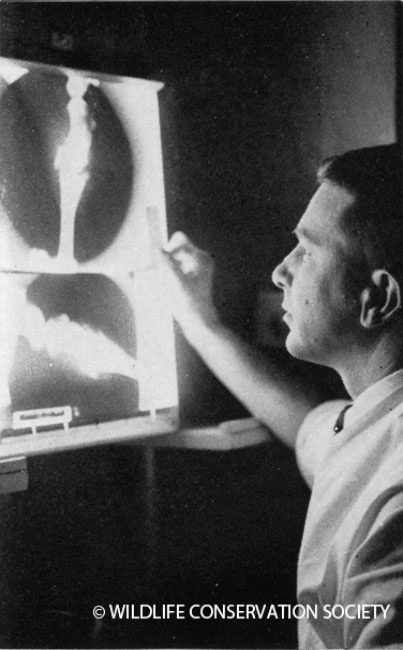 Gandal examining an x-ray, circa 1966. Animal Kingdom vol. LXIX (4), August 1966. 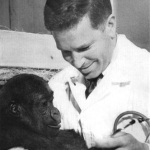 Not restricting himself solely to hands-on hospital and animal work, Gandal often took time to write to other zoo professionals and veterinarians, and also to respond to the large volume of letters that were sent his way. As a veterinarian at the largest zoo in America, Gandal received all sorts of animal-related mail from the public around the country. More often than not, Gandal was happy to reply to these letters, offering his insight, expertise, and love of animals. 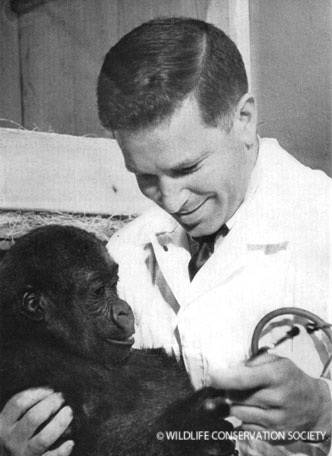 Gandal performing a checkup on a baby gorilla, circa 1966. Animal Kingdom vol. LXIX (4), August 1966. Frequenting Gandal’s mailbox were letters concerning the exotic and unusual pets that people needed help caring for, often from correspondents in the New York metropolitan area. As local veterinarians occasionally lacked the experience needed to treat exotic animals, Gandal was one of the most knowledgeable people in the area, and would be referred to or consulted for help. The variety of animals that people wrote about to Gandal was certainly eclectic, with questions about kinkajous, monkeys, mynah birds, peacocks, and ocelots, to name a few. Children’s entertainer Shari Lewis was among those seeking guidance, writing Gandal from across the country in an attempt to find a tiger cub to match her puppets! 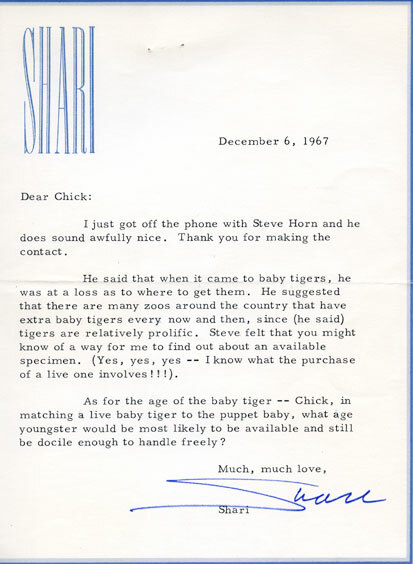 A letter from puppeteer and children’s TV show host Shari Lewis, 1967. WCS Archives Collection 2029. 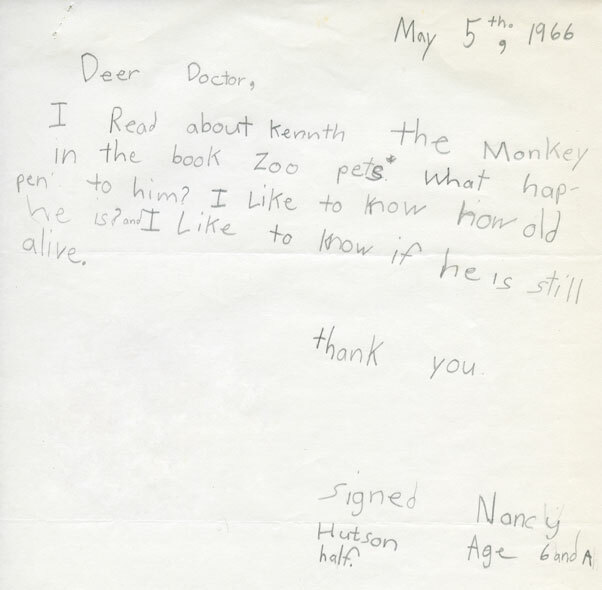 Of course, the work of a zoo veterinarian was of special interest to children, and letters from curious ones were a frequent occurrence in Gandal’s mail. Children wrote to him about their own animals and their stories, and like their older counterparts, consulted Gandal about their sick pets (however in these cases, gerbils were more likely to be ailing than monkeys). Many children also sent in letters asking about the work Gandal did, as they themselves were curious about working with animals. Indeed, in some adorable cases they asked about the specific animals they had seen him work with in a book or on a trip! A child’s letter to Dr. Gandal, 1966. WCS Archives Collection 2029. Though limited by manpower and medium–he would often qualify his advice with a “surely you will understand the difficulty involved in diagnosing an animal I have not examined…”–Gandal remained dedicated to his letters and providing help whenever possible. As with the other veterinarians at the New York Zoological Society, Gandal was intelligent, professional, and inviting: another interesting figure in the history of the zoo. This post was written by Andrew Wong-Crocitto, who worked during Summer 2014 as an Archives Processing Intern at the WCS Archives. He is a M.S.L.I.S. candidate at Pratt Institute, where he studies Archiving and User Experience. Andrew is interested in legacy media and hopes to be able to work with them in a digital context.